Hurrah!!! It is release week and the newest Subscription Kit, the October "Glory of Autumn" will start shipping in just a few days! To celebrate the newest Kit, we are having a Blog Hop! But if you Find yourself being impatient waiting for your Kit to get to you, feel free to hop over to White Rose Crafts and search through the October Subscription Kit Add Ons, that you can get at a 10% discount for a limited time. You just need to use the code: HAPPY FALL. For today's project I used Find It Trading's "Lilly Luna- Oak Tree" stamp which I colored using Chameleon Alcohol Markers. 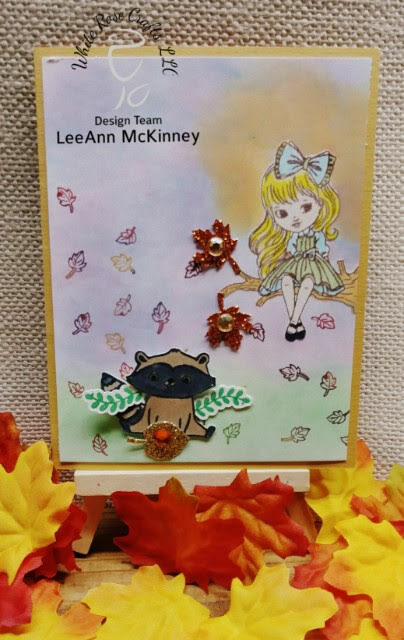 I also used "Scrapberry's "Forest Friends- Nature" stamp set for the Raccoon, and greens. I used "Jolees Dimensional Stickers with Gems-Fall Leaves Repeats". My background was done using Distress Oxides in Broken China, Shaded Lilac and Worn Lipstick for the sky, and Cracked Pistachio and Lucky Clover for the ground. LeeAnn <-- You are here!!! What a precious card! I am soooo loving the cute Lilly Luna-Oak Tree stamp that you used she is just so adorable! Cute scene. I like the falling leaves and the Jolees leaf stickers you used.